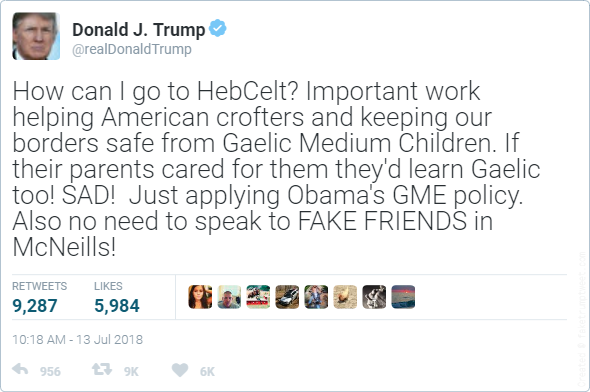 FakeTrumpTweet.com - How can I go to HebCelt? Important work helping American crofters and keeping our borders safe from Gaelic Medium Children. If their parents cared for them they'd learn Gaelic too! SAD! Just applying Obama's GME policy. Also no need to speak to FAKE FRIENDS in McNeills! Be kind, respectful, and spread the love with your tweets - just like Don! © FakeTrumpTweet.com. All rights reserved.